However, all these things are not cheap! If we don’t mend our free spending ways.. we sure cannot survive! 1) Food per day (breakfast, lunch, dinner and maybe some snack in between meals) = RM 15 to RM 20 (About RM 5 per meal). So, for a month it would be like RM 450 to RM 600! 2) Prepaid Top-Up cards = RM 10 per day, so for a month, it’ll be RM 300! So grand total for these four vital expenses is roughly about, RM 1200 per month and that is not including the other expenses! And the PTPTN loan that most of the IIUM students received is so much little as compared to that amount! So when I heard about this DiGi Campus plan and read thoroughly about the plan, I was excited and ecstatic with the offer, so I purchased it right away cuz after reading about it, I know this plan can help me save a lot, you know! And this is another exciting news..
And that’s not all!! 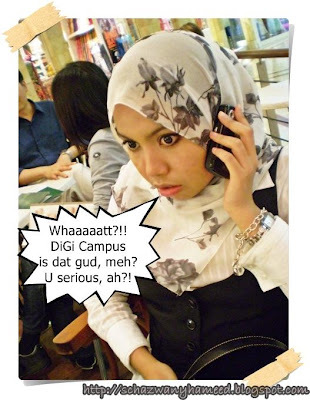 Apart from offering students with the lowest telco service charge ever, DiGi also offers you programs like Rewards & Privileges to honor and appreciate their users and customers.. such as Reload Bonus, Birthday Bonus, DiGi Rewards, Digi Music, and Fresh Grad Plan. This DiGi Campus Plan has more values and special rates and most importantly, more benefits for their users (students) if you wanna compare with other service providers’ plans. Come, let’s take a look! Yerp.. DiGi IS always the smarter choice!! To know more details about it, please visit here! And as far as I know, there are about 150 colleges and universities that have been selected for you to be able to purchase the pack. DiGi. It’s always the smarter choice. Wani, ada eh skrg Wifi prepaid? Ke i yg ketinggalan zaman? hehe..how to get it ya? plz let me know..thanks! p/s:Jadi student skrg mmg banyak spend kan..itu belum lagi kalau sewa rumah, kena bayar sewa rumah lagi, utilities semua...nasib zaman tu i dah go through..but once dah kerja lain pulak cite die..neverending la spending ni kan.. I just couldn't argue you everything about Digi..
they always have great deals!!!! ya lah...im a celcom user, eventho quite expensive,tp coverage dia bgus gila! i prnh plkn dlm hutan kat sarawak, n spe yg gne celcom je dpt make calls..yg lain keep on halakan handphone high above to get coverage..heee..
nway, geram jgk tgk rate digi ni..best sgt2..